As you well know, measuring the return on a marketing investment is a challenge. It takes time, discipline and tracking and, in many cases, the cooperation of others in your organization. So no matter how rich in resources and creativity a company might be, there’s no guarantee that at the end of every quarter it will be easy to pinpoint which of the strategies and tactics deployed were responsible for generating new business. Now for the good news… promotional products and gifts can help! Think of all the times you’ve seen the words: “When you call, mention this ad/letter/code and receive a free gift!” I’m not talking about a free gift with membership or a first-time order; that’s a different animal, we can talk about that offline. 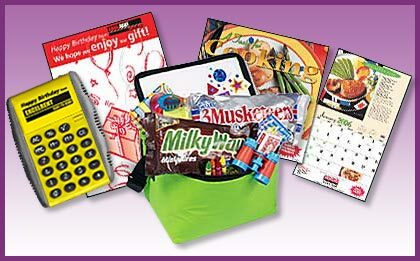 I’m suggesting that you rely on a promotional gift to entice prospects to further explore your products or services. Not only does this simplify measuring the effectiveness of a marketing activity, it increases the likelihood of having a meaningful dialogue with a prospect. A new dry-cleaning establishment is eager to build its clientele. They run a print ad inviting prospects to stop by to celebrate the opening of their store, meet the management, and receive a free gift: A calendar with notations every Sunday of the year, to promote their Sunday hours (a rarity). A rent-to-own company (furniture, appliances, electronics) sent birthday cards to inactive clients with the offer to stop by for a free birthday gift, a “live-action” calculator (so they could be reminded of the big savings by doing business with the company). An independent daycare center learns that a large, nationwide competitor is coming to town. They develop a Road Trip Survival Kit with activities to keep young kids entertained in the car, and mail invitations to area residents, offering the free kit in exchange for taking a tour of their facility. If you’d like to explore ways to encourage prospects to do business with you, give us a call at 708-478-8222 or send us an e-mail. Happy to help brainstorm!